MANILA -- And the LCK title stays in the hands of the 2017 LCK Summer Champions. 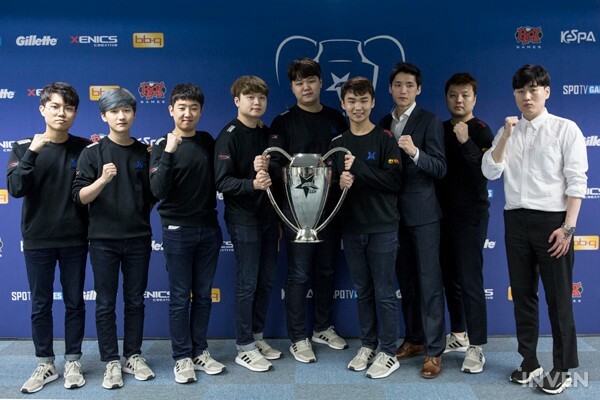 Kingzone DragonX (KZ) successfully defended their domestic throne as they dismantled the first-time finalists Afreeca Freecs (AFs), 3-1 in their best-of-5 Grand Finals date to win the 2018 LCK Spring Split at the Busan Sajik Gymnasium in Busan, South Korea, Saturday evening (Philippine time). Despite being directly seeded into the Finals through their first-place Regular Season finish (33-7, 16-2 in set), KZ (formerly Longzhu Gaming) didn't waste their three-week respite and also didn't let complacency devour them as the six-man veteran roster displayed their ever-consistent bulldozing of opponents, constantly crushing AFs's bot lane, in courtesy of AD Carry Kim (PraY) Jong-in even though losing the curtain-raiser, propelling them to their second straight title. With this, Kim, alongside the much-important win, was also hailed as the Finals MVP through his combined 9.75 Kill-Death-Assist (KDA) Ratio on Xayah, accentuating his match-high 10 kills in the same champion in Game 2. Aside from Kim, superstar mid laner Gwak (Bdd) Bo-seong also flashed his superiority in lane aggression once again with his Sion, Taliyah and his signature Zoe, ending the four-game series with an individual game-high 5/2/23 KDA (14 KDA Ratio). Veteran top laner Kim (Khan) Dong-ha also displayed his vintage Cho'Gath, Gnar, and his signature Jayce to utmost perfection, shutting his counterpart Kim (Kiin) Gi-in down even though being camped by AFs, thus co-leading Kim in the kills category with 6 combined kills. With the win, KZ will represent Korea in the 2018 Mid Season Invitational this May 5 to 20 in Germany and in the upcoming 2018 Rift Rivals (vs. China and Taiwan) as Korea's first seed. AFs, on the other hand, will join the said team, and fellow runners-up KT Rolster and SK Telecom T1 in their Rift Rivals campaign.